Do you need some help on choosing a valentine gift? We have an amazing solution! At WiseDecor, we have wall letters that are not only wall decor they are a personalized statement! ‘I love thee with the depth and breadth and height my soul can reach. 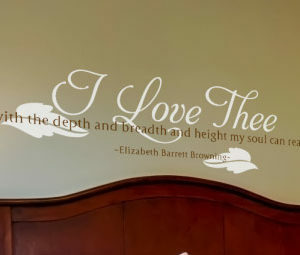 – Elizabeth Barrett Browning’ wall words will look great in your bedroom. Apply them on a focal point in the room such as above the headboard. For a stunning visual display make sure they are not too far from a light source such as a bedside lamp stand or between sconces on the wall! Do confirm that they contrast well with the underlying wall for visibility purposes. Top it up by selecting wall words that tie in with the decor in the room such as the bed, duvet and floor. Waking up to this wonderful message will let your spouse know that you cherish them ….and have a great sense of style! Pay us a visit on our website. Have a look at our ‘By Theme: Holidays and Events-Valentine’ category. You will be pleasantly surprised by our library! Select a quote or submit your preferred quote. Our designers will work with either! Our wall quotes are affordable, easy to apply, durable and created for all lighting situations! You do get value for your money. Do call or email. Let us help you create a memorable holiday gift!